Tribes Overall: "It exceeded our expectations, the whole experience from start to finish was very special." Tribes Service: "Sinead was brilliant and patiently responded to my queries when I had not read the information properly! I know pairing unknown people up in a group is probably a bit hit and miss when we are not known to you, but the group of people we were with were brilliant and we all got on well, so thank you for that as well." Guides: "Our guide could not have been better, he was very knowledgeable and informative, a keen photographer himself he was always looking for the best angles and light for the photographers in our group. He was a very considerate driver. And along with the camp staff they all added to the enjoyment of the holiday through their friendliness and efficiency and wonderful food." Social & Environmental Responsibility: "It certainly provides employment for the local communities and those we came across were determined to preserve the wonderful scenery and wildlife in their country. We gained a greater understanding and respect for what is being achieved in Botswana. My only criticism was that in one or two instances I felt that visitors (not in our group),put photography before the needs of the animal they were focusing on." Just what we needed, a place to relax, enjoy the views and peaceful after a long trip and before our camping adventure got underway. 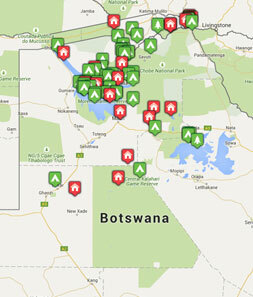 We have had many wonderful holidays over the years, including two self drives in Southern Africa. This has to be one of the best all round experiences we have had and Letaka has a lot to do with that, we feel very privileged to have had their expertise and friendship whilst we were their guests. "First night in camp a group of wild dogs took down an impala about 4 to 5 metres from where we were eating our evening meal, a bit of a shock at first but riveting, they did not keep it for long though as hyenas soon snatched the carcass and ran off. Last day on our way to the air strip we came across two large groups of dogs who were fighting over territory and as one group retreated we were able to watch the interaction between the other group as they regrouped. In between we saw leopards most days, lions, cheetah and a huge variety of other birds and animals. Every day was a ‘high’."